Provide dog owners the means to pick up after their dogs with our Dogipot® pet waste station with Header Pak option, part 1003HP-L. The regular Dogipot Jrs dispense rolls of bags but the Dogipot Jr Header Pak is made especially for hanging bag cards and bags are torn off the card. Each card holds 100 bags. Instead of two diamond shaped openings, there is a larger opening. Dogipot® Jr. Aluminum Bag Dispenser, Header Pak Option (uses Header Pak refill bags part 1402HP). Can not be used with Dogipot refill rolls part 1402. 12" x 18" reflective aluminum pet sign that reads "Pet Waste Transmits Disease Leash And Clean Up After Your Pet Please Keep This Area Clean"
1. 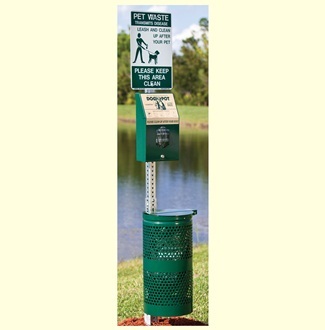 Select a good visible spot in your community or park where you want to install the Dogipot Pet Station. 2. Prior to installation, remove the 1 3/4" x 1 3/4" x 4 ft portion of the mounting post from the 2" x 2" x 4 ft portion of the mounting post before cementing. Insert the larger portion of the mounting post (2" x 2" x 4 ft) approx. 14" into an 18" x 8" hole filled with a 40 lb bag of "ready to use" concrete mix. To stabilize the post while cementing, place a rod, bolt or other device through the two bottom holes, prior to inserting into the ground and cementing. Level the post in a straight vertical position and let concrete dry for at least 12 hours. 3. After the concrete is dry, insert the smaller portion of the post (1 3/4" x 1 3/4" x 4 ft) into the larger cemented portion of the post (2 ft x 2 ft x 4 ft) until the first 4 holes are lined up between the two posts. Use two (2) carriage bolts, washers and locknuts to fix the telescope post in position, the upper bolt in the top overlapping hole, pointing from right to left and the lower bolt 4 holes below, pointing from front to back. The total height above ground with both post parts should now be approx. 6 feet 6 inches. 4. Start by installing the Pet Sign on top of the 1 3/4" post, with the upper hole matching the most upper hole in the square post using the enclosed 2 1/2" bolts, washers and locknuts. Continue installing the Dogipot Jr. Bag Dispenser according to the mounting instructions enclosed with the Dispenser, ensuring that the upper edge of the Dispenser is approx. 1" below the lower edge of the Pet Sign. 5. Install the steel waste receptacle through the pre-drilled top oval holes in the back wall of the receptacle and through the square post with the remaining bolts, washers and locknuts, using the 2 3/4" bolt on top and the 2 1/2" bolt below. The upper edge of the waste receptacle must be approximately 12 1/2" below the lower end of your Dogipot Jr. Bag Dispenser. The upper back wall of the waste receptacle is supposed to touch the head of the lower post carriage bolt, which creates some space between the post and the receptacle, allowing the receptacle lid to open from left to right, without touching the post. 6. Insert one of the enclosed Dogipot Liner Trash Bags into the waste receptacle, folding it over the interior retainer bands. 7. ENJOY WATCHING PET OWNERS PICK UP AFTER THEIR DOGS! Go to top of this DOGIPOT Pet Station with Aluminum Header Pak Bag Dispenser, 1003HP-L page.